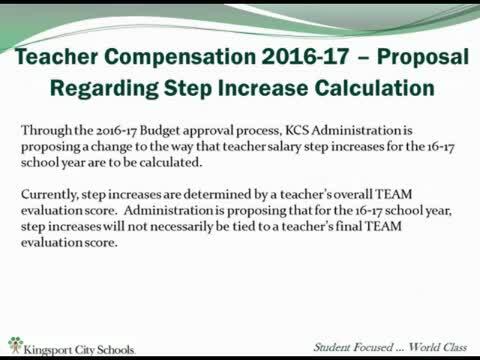 Through the 2016-17 Budget approval process, KCS Administration is proposing a change to the way that teacher salary step increases for the 2016-2017 school year are to be calculated. Currently, step increases are determined by a teacher’s overall TEAM evaluation score. Administration is proposing that for the 16-17 school year, step increases will not necessarily be tied to a teacher’s final TEAM evaluation score. The budget proposal is that step increases for next year will be determined by the average of a teacher’s 2015-16 classroom observation scores, removing TNReady/TCAP generated data (Achievement and Growth Scores) from salary calculations. The only exception to this would be that if a teacher's final TEAM Evaluation score (that includes TNReady/TCAP data) would have resulted in a higher step increase based on the original scale, the teacher would automatically receive the higher increase. In this video, Andy True, KCS Assistant Superintendent - Administration provides additional information regarding this proposal, which will be considered as the final 2016-2017 KCS Budget is approved in the coming weeks. For more information, contact Andy True at 2130.